Over 200 Varieties of Muffins! has been serving Anacortes and its surrounding area for over 17 years with fine Muffins and Pastries “Like your Mother used to make” – or better as our goal! We bake seven days a week 365 days a year. It all started in 1990 with a few baked goods in the early morning hours, but Oh! How it has evolved. Today you will find a tempting array of fresh Pastries including traditional Croissants, Danish, fruit filled Turnovers, Cinnamon Rolls, Muffins and more. 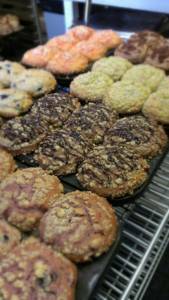 We also have a large selection of health conscious Muffins and Pastries that we bake every day. Visit our “Bakery” Slideshow for a tantalizing tour of our tasty treats). All the cookies and treats you can eat! Seven days a week our bakers also bake a line of fresh Artisan style breads and on alternative days either our popular Australian Scones or our baked Cinnamon-Apple-Raisin Fritters. 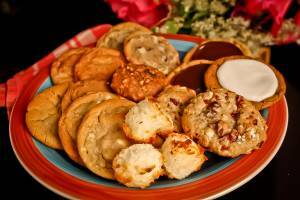 Any time of day you can satisfy your sweet tooth by indulging in our Homemade Cookies, baked with “butter and love”. Relax, enjoy and unwind in our comfortable dining room with your freshly baked treat and a superb coffee from our espresso bar.